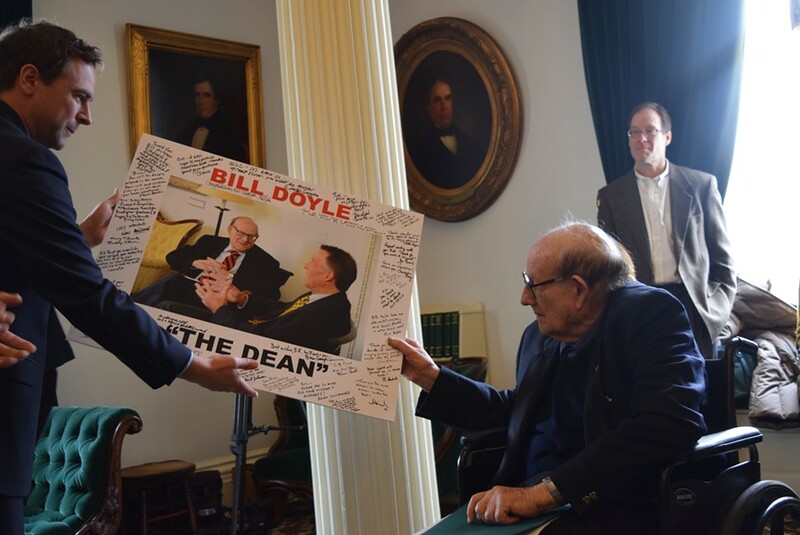 Senate President Pro Tempore Tim Ashe (D/P-Chittenden) presents former senator Bill Doyle with a signed photo Tuesday. 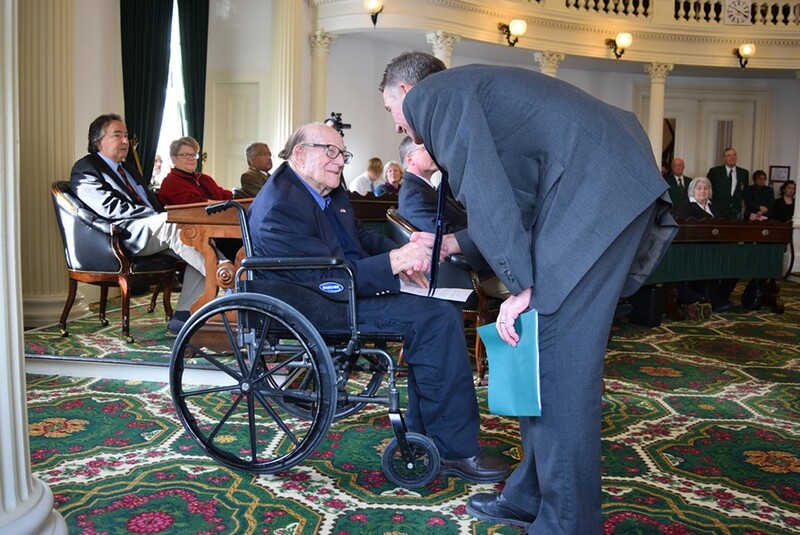 For 48 years, Bill Doyle had a seat in the Vermont Senate. On Monday, he sat off to the side as his former colleagues honored him at the start of their first legislative session without him. 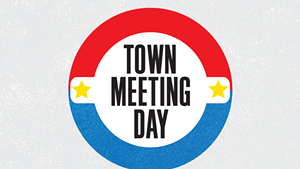 Senators officially declared this year’s Town Meeting Day, which takes place March 7, in honor of the longtime lawmaker. The Montpelier Republican is known throughout the state for the annual Town Meeting Day poll he started in 1969. 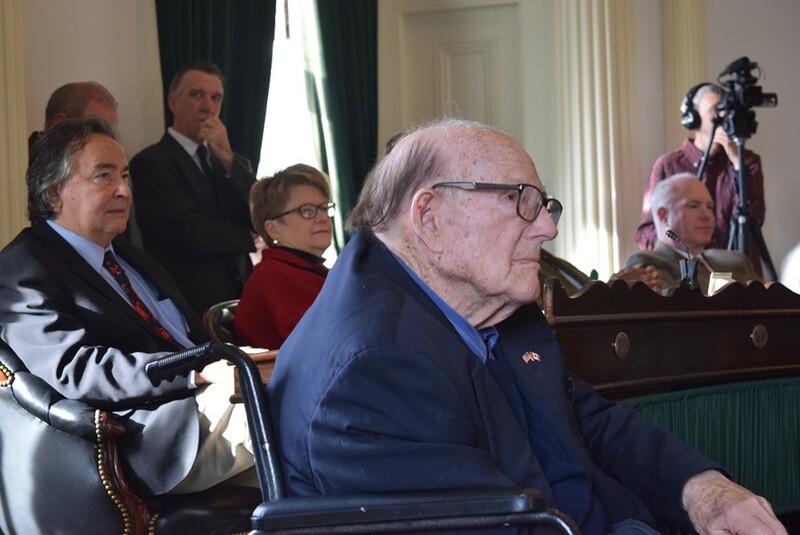 Bill Doyle listens as senators honor him, while Gov. Phil Scott looks on. Doyle, 90, sat quietly in his wheelchair as several former colleagues spoke glowingly about his commitment to democracy, free buffet food and his constituents. Among the speakers was newly installed Gov. Phil Scott. The state’s longest-serving senator, who also teaches political science at Johnson State College, lost his reelection bid in November. “It was like a lesson on civics,” Sen. Jeanette White (D-Windham) said of her time serving with Doyle on the Senate Government Operations Committee. Gov. Phil Scott congratulates former senator Bill Doyle. Vermonters can thank Doyle for creating Vermont’s open primary election system with no political party enrollment, said former senator Vince Illuzzi. And it is because of Doyle’s insistence on fairness that Vermont legislators have a tradition of allowing minority party members to hold committee chairmanships, he said.